This is a qualitative study about in-service teachers who were enrolled in a graduate level course that focused on new literacies and the integration of technology with literacy. They also taught children enrolled in a summer writing camp as part of the course. The authors also followed the teachers into their classrooms once the graduate course ended to see if and how they were integrating technology. The primary focus of this article is on how some of the teachers began to integrate technology into their instruction. An additional finding was that testing presented an especially challenging barrier to technology integration. Zoch, M., Myers, J. & Myers, J. (2017). Teachers’ Engagement with New Literacies as Support for Implementing Technology in the English/Language Arts Classroom. Contemporary Issues in Technology and Teacher Education, 17 (1), 25-52. Waynesville, NC USA: Society for Information Technology & Teacher Education. Retrieved April 24, 2019 from https://www.learntechlib.org/primary/p/151010/. Bai, H., & Ertmer, P.A. (2008). Teacher educators' beliefs and technology uses as predictor of preservice teachers' beliefs and technology attitudes. Journal of Technology and Teacher Education, 16(1), 93-112. Bailey, N.M. (2009). "It makes it more real": Teaching new literacies in a secondary English classroom. English Education, 41(3), 207-234. Barron, A.E., Kemker, K., Harnes, C., & Kalaydjian, K. (2003). Large-scale research study on technology in K-12 schools: Technology integration as it relates to the national technology standards. Journal of Research on Technology in Education, 35(4), 489-507. Boardman, A.G., & Woodruff, A.L. (2004). Teacher change and “high-stakes” assessment: What happens to professional development? Teaching and Teacher Education, 20(6), 545-557. Brennan, K. (2015). Beyond right or wrong: Challenges of including creative design activities in the classroom. Journal of Technology and Teacher Education, 23(3), 279-299. Coiro, J.L. (2005). Every teacher a Miss Rumphius: Empowering teachers with effective professional development. In R.A. Karchmer, M. Mallette, J. Kara-Soteriou, & D.J. Leu (Eds. ), New literacies for new times: Innovative models of literacy education using the Internet (pp. 199-219). Newark, DE: International Reading Association. Earle, R.S. (2002). The integration of instructional technology into public education: Promises and challenges. Educational Technology, 42(1), 5-13. Ertmer, P.A., Gopalakrishnan, S., & Ross, E.M. (2001). Technology using teachers: Comparing perceptions of exemplary technology use to best practice. Journal of Research on Technology in Education, 33(5), 1-26. Ertmer, P.A., & Ottenbreit-Leftwich, A. (2010). Teacher technology change: How knowledge, confidence, beliefs, and culture intersect. Journal of Research on Technology in Education, 42(3), 255-284. Ertmer, P.A., & Ottenbreit-Leftwich, A. (2013). Removing obstacles to the pedagogical changes required by Jonassen's vision of authentic technology-enabled learning. Computers and Education, 64, 175-182. Ertmer, P.A., Ottenbreit-Leftwich, A., Sadik, O., Sendurur, E., & Sundurur, P. (2012). Teacher beliefs and technology integration practices: A critical relationship. Computers and Education, 59(423-435). Flanagan, S., & Shoffner, M. (2013). Technology: Secondary English teachers and classroom technology use. 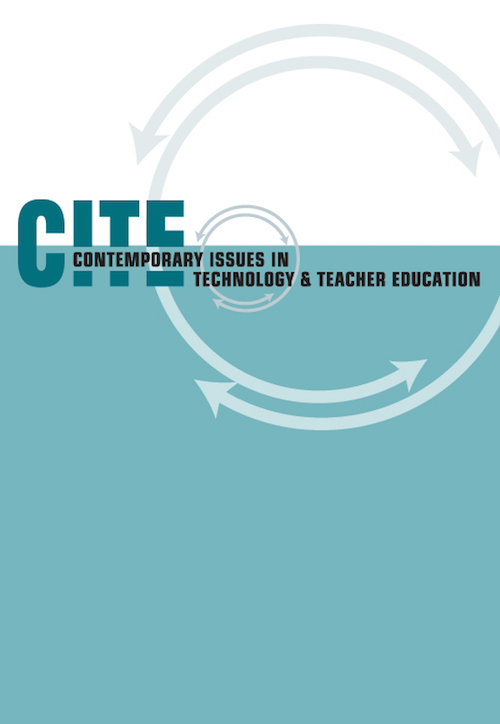 Contemporary Issues in Technology and Teacher Education, 13(3), 242-261. Grant, M.M., Tamim, S., Brown, D.B., Sweeney, J.P., Ferguson, F.K., & Jones, L.B. (2015). Teaching and learning with mobile computing devices: Case study in K-12 classrooms. TechTrends, 59(4), 32-45. Hagood, M.C. (2012). Risks, rewards, and responsibilities of using new literacies in middle grades. Voices From the Middle, 19(4), 10-16. Harris, J.B., & Hofer, M.J. (2011). Technological pedagogical content knowledge (TPACK) in action: A descriptive study of secondary teachers' curriculum-based technology-related instructional planning. Journal of Research on Technology in Education, 43(3), 211-229. Husbye, N.E., Buchholz, B., Skidmore Coggin, L., Wessel Powell, C., & Wohlwend, K.E. (2012). Critical lessons and playful literacies: Digital media in PK-2 classrooms. Language Arts, 90(2), 82-92. Hutchison, A., & Reinking, D. (2011). Teachers' perceptions of integrating information and communication technologies into literacy instruction: A national survey in the United States. Reading Research Quarterly, 46(4), 312-333. Inan, F.A., & Lowther, D.L. (2010). Factors affecting technology integration in K-12 classrooms: A path model. Educational Technology Research and Development, 58, 137154. Kellner, D. (2000). New technologies/new literacies: Reconstructing education for the new millenium. Teaching Education, 11(3), 245-265. Kinzer, C.K. (2010). Considering literacy and policy in the context of digital environments. Language Arts, 88(1), 51-61. Lankshear, C., & Knobel, M. (2011). New literacies: Everyday practices and social learning. Berkshire, England: Open University Press. Lapp, D., Moss, B., & Rowsell, J. (2012). Envisioning new literacies through a lens of teaching and learning. The Reading Teacher, 65(6), 367-377. Leu, D.J., Kinzer, C.K., Coiro, J.L., & Cammack, D.W. (2004). Toward a theory of new literacies emerging from the Internet and other information and communication technologies. In R.B. Ruddell & N.J. Unrau (Eds. ), Theoretical models and processes of reading (5th ed., pp. 1579-1613). Newark, DE: International Reading Association. Lincoln, Y.S., & Guba, E.G. (1985). Naturalistic inquiry. Beverly Hills, CA: Sage. McGrail, E. (2005). Teachers, technology, and change: English perspectives. Journal of Technology and Teacher Education, 13(1), 5-24. Miranda, H., & Russell, M. (2011). Predictors of teacher-directed student use of technology in elementary classrooms: A multilevel SEM approach using data from the USEIT study. Journal of Research on Technology in Education, 43(4), 301-323. Miranda, H., & Russell, M. (2012). Understanding factors associated with teacher-directed student use of technology in elementary classrooms: A structural equation modeling approach. British Journal of Educational Technology, 43(4), 652-666. National Council of Teachers of English. (2007). 21st-century literacies: A policy research brief. Urbana, IL: Author. National Council of Teachers of English. (2013). The NCTE definition of 21st century literacies. Urbana, IL: Author. Norris, C., Sullivan, T., Poirot, J., & Soloway, E. (2003). No access, no use, no impact: Snapshot surveys of educational technology in K-12. Journal of Research on Technology in Education, 36(1), 15-28. O'Brien, D., & Scharber, C. (2008). Digital literacies go to school: Potholes and possibilities. Journal of Adolescent and Adult Literacy, 52(1), 66-68. O'Hara, S., Pritchard, R., Huang, C., & Pella, S. (2013). Learning to integrate new technologies into teaching and learning through a design-based model of professional development. Journal of Technology and Teacher Education, 21(2), 203-223. Overbay, A., Patterson, A., Vasu, E., & Grable, L. (2010). Constructivism and technology use: Findings from the IMPACTing leadership project. Educational Media International, 47(2), 103-120. Payne, D. (2000). Teacher professional development: The principal's critical role. NASSP Bulletin, 84(618), 13-21. Pope, C.A., & Golub, J.N. (2000). Preparing tomorrow's English language arts teachers today: Principles and practices for infusing technology. Contemporary Issues in Technology and Teacher Education, 1(1), 89-97. Sheingold, K., & Hadley, M. (1990). Accomplished teachers: Integrating computers into classroom practice. New York, NY: Center for Technology in Education, Bank Street College of Education. Shoffner, M., Oliveira, L.C., & Angus, R. (2010). Multiliteracies in the secondary English classroom: Becoming literate in the 21st century. English Teaching: Practice and Critique, 9(3), 75-89. Smerdon, B., Cronen, S., Lanahan, L., Anderson, J., Iannotti, N., & Angeles, J.(2000). Teachers' tools for the 21st century: A report on teachers' use of technology. Washington, DC: National Center for Education Statistics. Solomon, G., Allen, N., & Resta, P. (2003). Toward digital equity: Bridging the divide in education. Boston, MA: Pearson Education. Staples, A., Pugach, M.C., & Himes, D. (2005). Rethinking the technology integration challenge: Cases from three urban elementary schools. Journal of Research on Technology in Education, 37(3), 285-311. Street, B. (1995). Social literacies: Critical approaches to literacy development, ethnography, and education. Harlow, Essex: Longman Group Limited. Wohlwend, K.E. (2010). A is for avatar: Young children in literacy 2.0 worlds and literacy 1.0 schools. Language Arts, 88(2), 144-152.